Have you ever purchased office supplies because you thought you needed them? And then later you realized you already had a bunch but you just couldn't find them because your desk drawers were too cluttered? Have you ever found something completely useless when you looked through your desk? 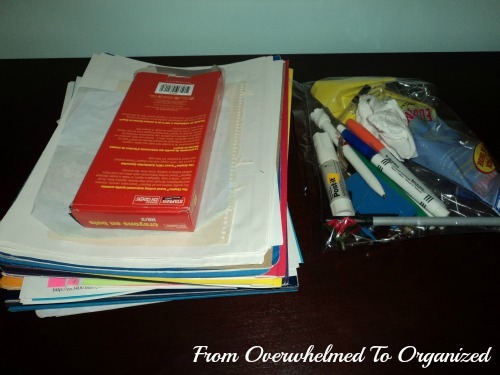 Today's post is part three of my progress organizing my "office" this week. 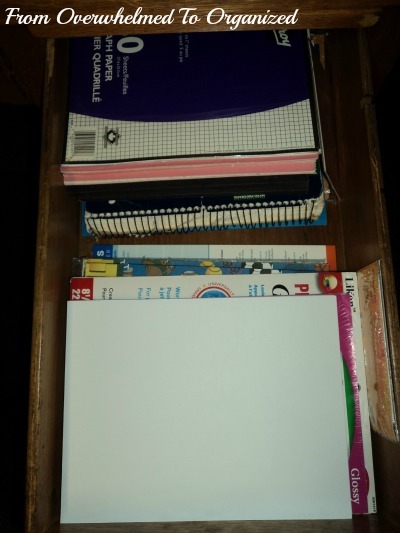 If you missed yesterday's post on organizing my dining room desk drawers, or the post earlier tonight on purging books and organizing shelves, you can read them here and here. First, I purged a lot from these drawers and then I reorganized which items were in which drawers so everything made more sense. 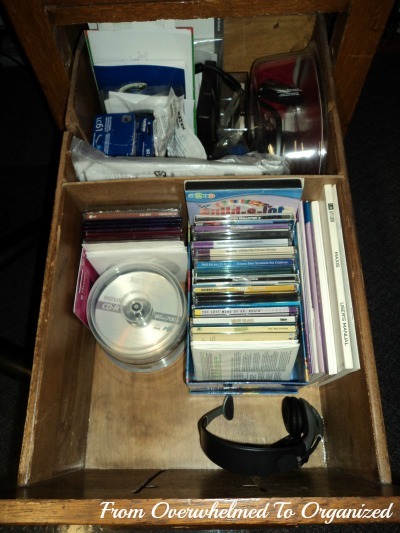 Starting with the left side of the desk, here's the top drawer before. It had mostly school supplies in it before. And here it is now. 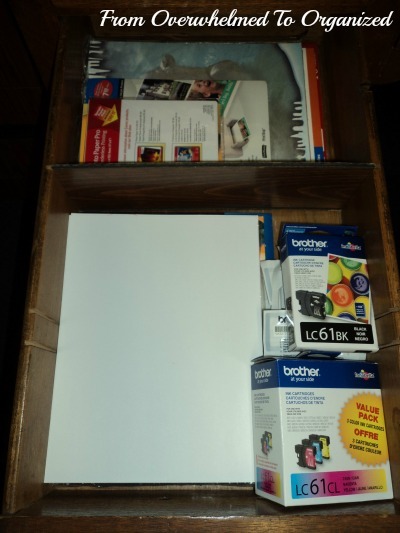 I made it a drawer for all the printer supplies since it's the drawer closest to the printer. I've got card stock, sticker paper, labels, and regular white paper in the front because I use those items the most. At the back I put all the special papers together (photo paper and stationary for the printer). I also moved the extra printer ink to this drawer. Now everything is easily accessible right by the printer when we need it. 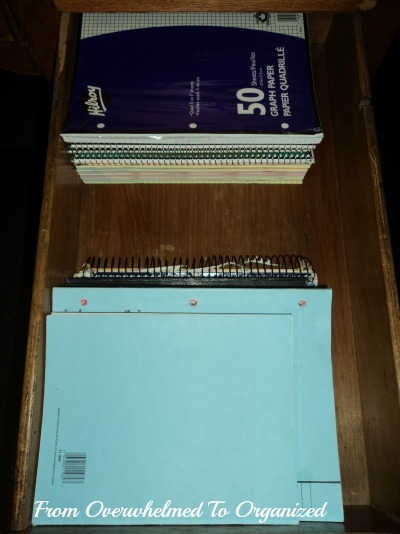 The middle drawer on the left side had a bunch of note pads and a few more school supplies in it before. If it looks a little empty at the front it's because I used to keep a lot of our craft supplies in here but I took them out last summer when I set up our craft area. Never really filled the space back up after that. I purged a lot of note pads (no idea why we had SO many of them but now the collection is more manageable!). Here's the drawer now. I put some of the small note pads in that blue box that used to be on the desk shelves (it fittingly says "Notes and Stuff" on the side of the box!). I also purged a lot of duo-tangs and pocket folders that were in a few different drawers before and just kept a few of each that were in the best shape. We're on a tight budget so I hate getting rid of things that are still usable but it doesn't make sense to keep storing so many things that we can easily and cheaply replace if necessary. And it feels good to have less cluttered drawers! The bottom left drawer was so full before that it barely opened sometimes. 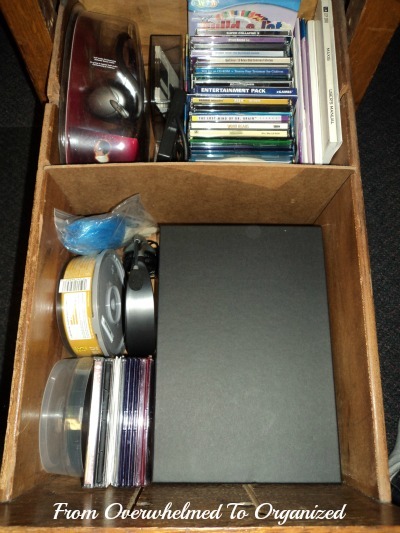 Again, I purged some things and then stored a few binders and binder accessories in this drawer. Now it closes easily! I've also kept a clipboard in here (I'm sure I'll have a great use for it at some point!). And some mailing labels and large envelopes. 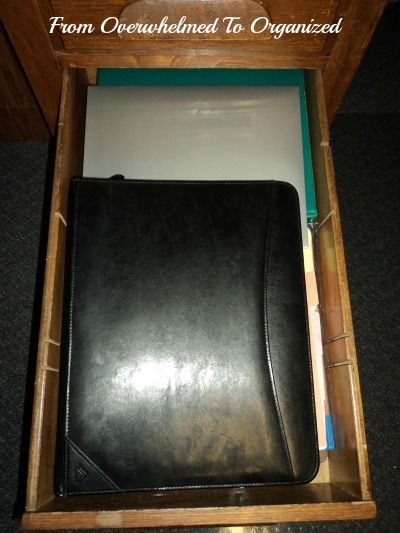 The black binder/folio that was in this drawer before is now up beside the dining room desk. It was never a good fit for a drawer! Now, on to the centre drawer. It was semi-organized before but again I put on my de-cluttering hat to make it more manageable. This is a very shallow drawer but I can really fit a lot into it! 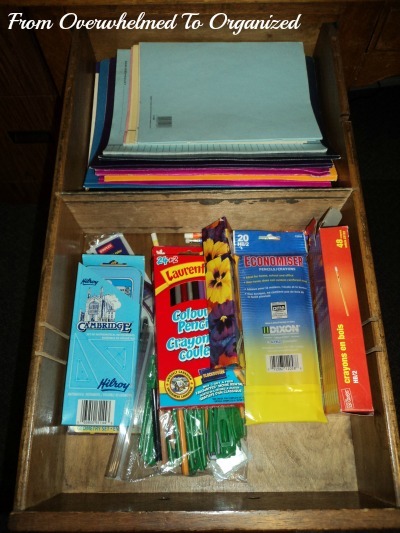 I rearranged things a bit so I can fit my 3-hole punch and stapler in the drawer, as well as some of the school supplies that were in the other drawers before. I relocated a few things to the upstairs desk where they'll be used more often. 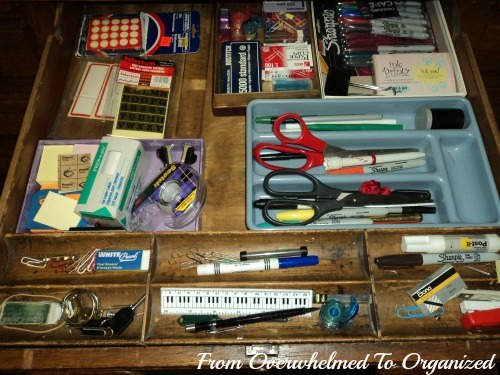 I grouped like things together and contained them in the organizers I had before (3 box lids and an old drawer organizer). I also added an empty raspberry container to hold the push pins. It definitely feels less overwhelming now! 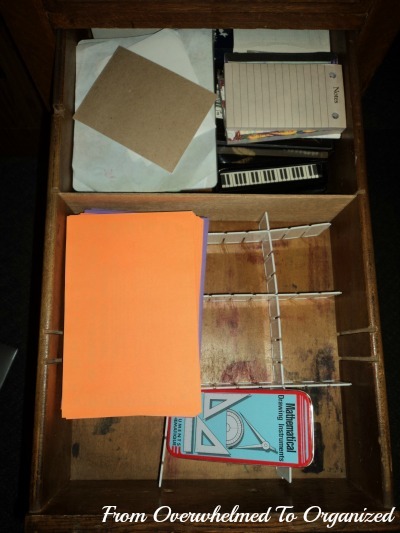 The top right drawer used to hold all our printing paper as well as a few school notebooks. We clearly are not using notebooks as quickly as I thought we would when I bought them during "back-to-school" sales last fall. They were ridiculously cheap. Lesson learned though. Just because something is cheap, doesn't mean I need to buy it and store it. Especially if we don't need it (or very much of it). I'm quite sure I will not need to buy notebooks for several years. 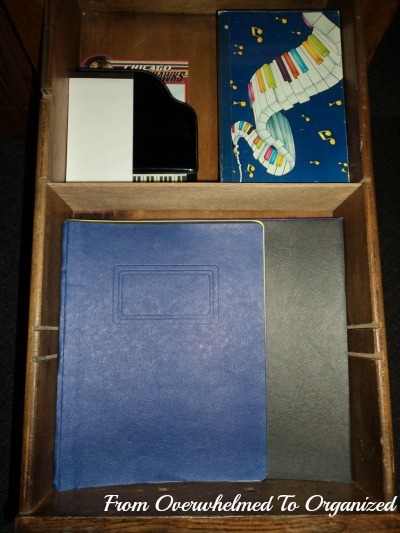 And, last, but not least, the bottom right deep drawer. I showed you a few weeks ago the progress I'd made on this drawer and I mentioned that I wanted to work on it a little more still. 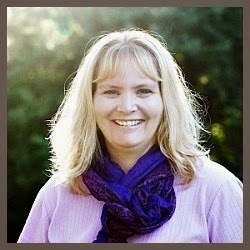 And do you remember this picture from a few weeks ago after I de-cluttered it? It wasn't bad but still needed some tweaking. Well, here's now it looks now. I swapped some of the back and front items, based on how frequently we use them. 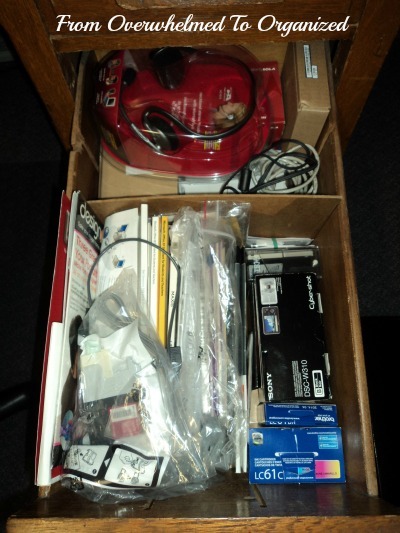 And I added a photo box to contain a lot of the loose items. 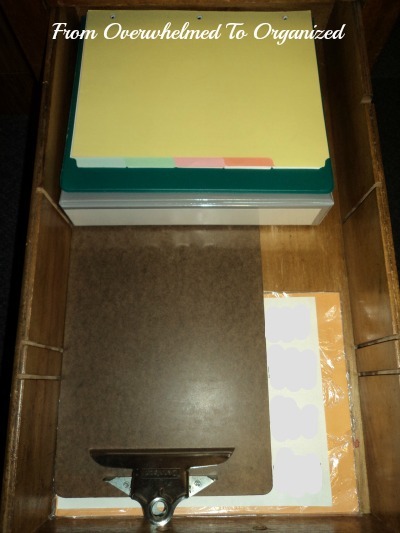 I kept the things I need to access most often near the top of this box so I don't have to waste time hunting for them. The drawer is even deep enough to add another photo box on top of this one, so in the future, if I need more storage for computer accessories, I can do that. Here are my recycle and garbage piles after going through all the desk drawers. I don't know why we always end up with pens and markers that don't work! And here's my donation pile. There's a rummage sale at my parents' church in a few weeks so some of this will be donated there and some of it I will put on Freecycle. So, that's it for the basement desk! Whew! It feels amazing to have organized all those drawers. 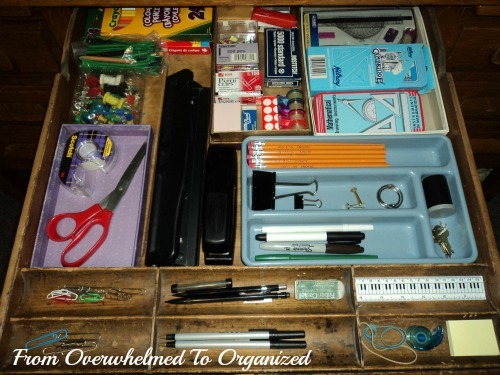 I'm confident the systems I've put in place in these drawers will help me to keep them organized better too. Store your items based on how often you use them. Keep frequently-used items in the most accessible places and lesser-used items at the back of drawers or underneath other items. Keep items together with or near other items that are used at the same time. For example, I put my printer supplies near the printer. 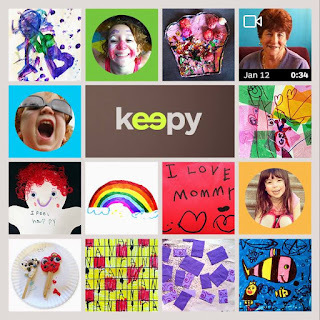 Don't keep (or buy!) items that you don't use regularly and that you can cheaply replace when needed. There's no sense taking up valuable space with items you don't need very often. Especially when they don't cost very much and are readily available. 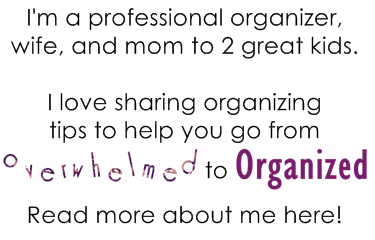 So, those are now all the organizing projects that I completed this week. 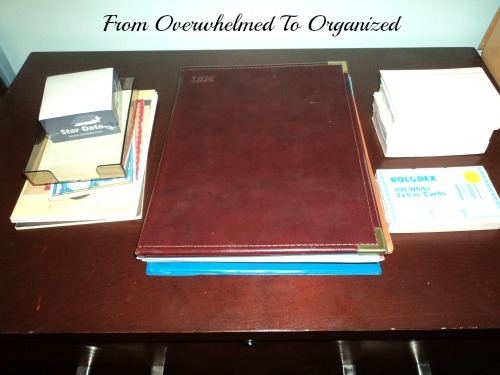 What's the craziest thing you've ever found when you organized? Have you ever stocked up on something because it was on sale but then realized later you have way too many of them? 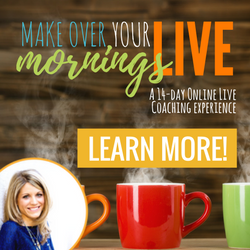 Do you have a hard time purging things that are still perfectly good? Do you have any other office organizing tips to add? You did a great job! Wow! 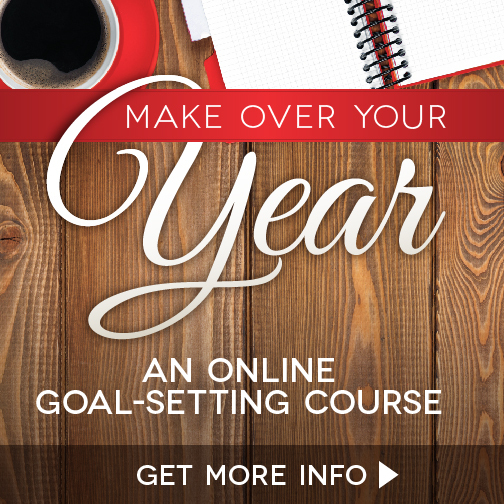 I bet you feel like you're in a whole new space every time you sit down at one of your desks.